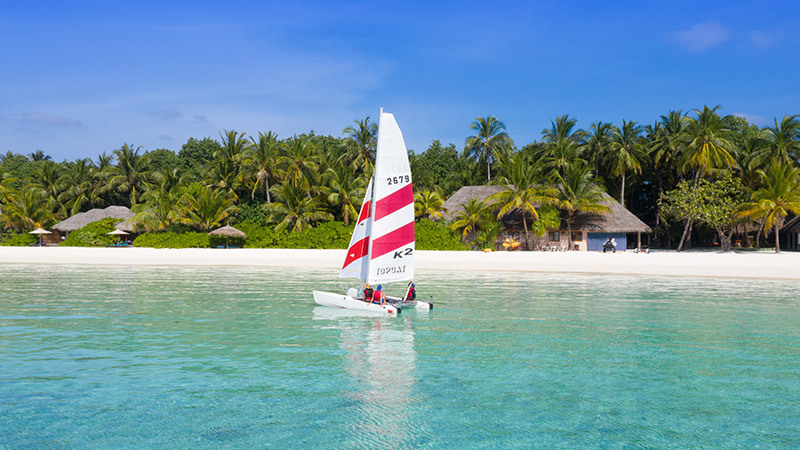 Catamaran sailing is yet another exciting way to explore the awe-inspiring beauty of Maldives with both relaxation and a sea adventure thrown into the mix. There is no better way to enjoy a beautiful day under the Maldivian sun, than inviting your companion to join a stylish catamaran sailing trip across the Indian Ocean. Feel the sun on your skin and the gentle tropical breeze in your hair, as you admire the majestic beauty of the endless ocean in the distance and take Instagram worthy shots to share with your friends back home. Ready to embark? Please drop us an email at veligandu@oceangroup.mv or visit our Ocean Water Sports Centre directly and book your catamaran now!